It’s turning into a royal rumble at SXSW — the sheer number of location-based networking apps hoping to emerge from the conference as this year’s breakout hit is nearly overwhelming. What’s worse, they’re often so similar in nature, so it’s hard to discern the advantages of one over another. They can’t all be winners. 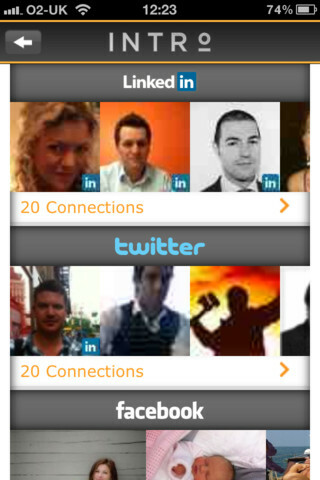 Is the app for business networking or making new friends? Does it use check-in data from other networks like Facebook and Foursquare, or does it just connect you with your friends? How does the app know who’s nearby? Does it kill your battery? Below, we’ve rounded up all the hottest apps in the newly-hot, location-based networking space, so you can fill up your phone for SXSW…and beyond. To be clear, the idea for location-based social networking is hardly a new one. Last fall, we dove into this still-emerging trend, highlighting new apps like Sonar and Banjo, plus last year’s SXSW darling, the group chatting app Yobongo, as well as the micro-networking app LoKast, the business-focused Mingle, and the now-shuttered Holler. While some of those same apps are still around, hoping to win the love of SXSW attendees, they’re now joined by a legion of others that have the same goal. Desperate for a cheat sheet to the forthcoming app battle? So were we. While the purpose of this post is to feature mobile apps, there are other services available to help SXSW attendees connect. You may want to also check out Meeteor, for example, which just launched an online networking site for SXSW attendees. Or you can track your meetings using Hashable. And of course, there’s always Twitter and Foursquare. Let’s start with the buzziest of the bunch: Highlight has been getting a lot of attention pre-SXSW, especially from members of the tech scene. 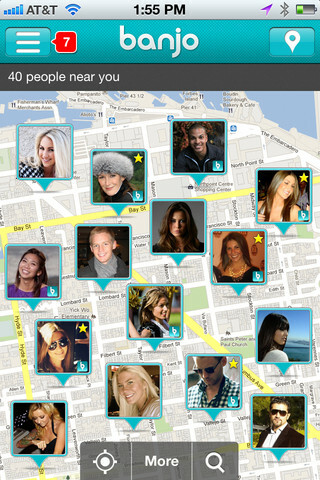 The app uses your Facebook profile to match you up with nearby friends who share your interests. 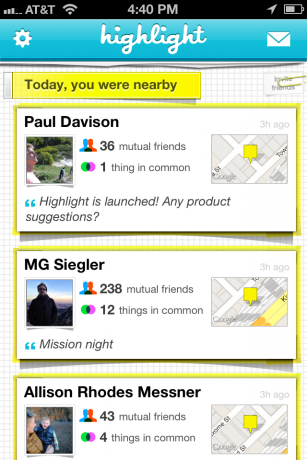 Highlight has a very cool and simple design, but it also seems to be moving toward becoming a personal, social CRM system that helps you remember people’s names and when you met them, as well as just suggesting nearby people you may like. Pros: Good for Facebook users, making social connections; the team acknowledges that women have safety/privacy concerns with these apps and are working to address that; great design. 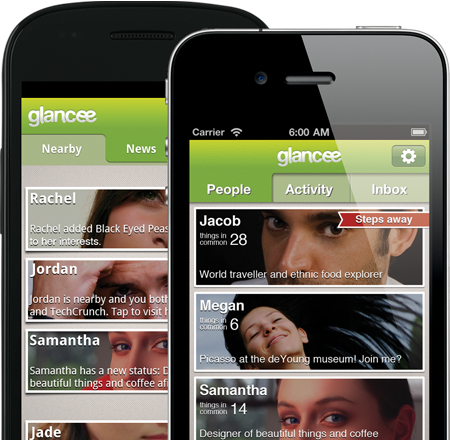 Another new contender, Glancee is most like Highlight, in that it also uses your Facebook profile data and interests to help you discover nearby users. But unlike Highlight, it doesn’t display people’s exact location on a map, only giving a general distance (e.g. “5 miles from you”). People are ranked by distance and common interests. On the app’s homescreen, it summarizes how many things you have in common – possible conversation starters, I suppose. You can then reach out to those suggested folks using the app’s built-in chat function. And it has a new update coming tomorrow. Banjo has been around for a bit, but a recent update has given the app enough new polish to see it achieve “featured” status in the iTunes App Store. The best part about Banjo is that it doesn’t have a desolate first-launch experience – that is to say, even if none of your friends use the app, Banjo may still prove useful. Instead of only relying on Facebook, Banjo also taps into data from Twitter, Foursquare, Instagram and more, and shows you where people are and what they’re saying/doing, based on their check-ins or geotagged tweets. 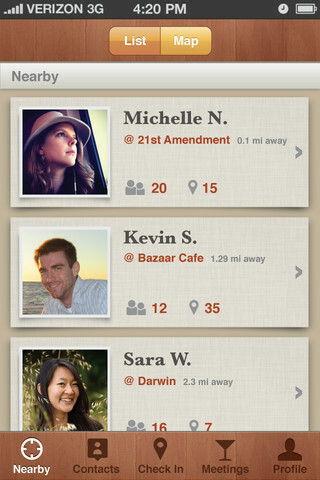 The app also lets you know when your actual friends are nearby, even if they’re not on Banjo. Just launched today, INTRO is meant for business, not social, networking. The app is built on top of LinkedIn, and includes messaging, privacy features and a premium “teleport” option that lets you virtually network with others anywhere in the world. In order not to limit itself only to INTRO users, the app also uses Facebook, Twitter and Foursquare data to display other nearby users. Sonar, updated just in time for SXSW, has moved away from focusing on people checked into particular venues and now focuses more on finding recommended people nearby. 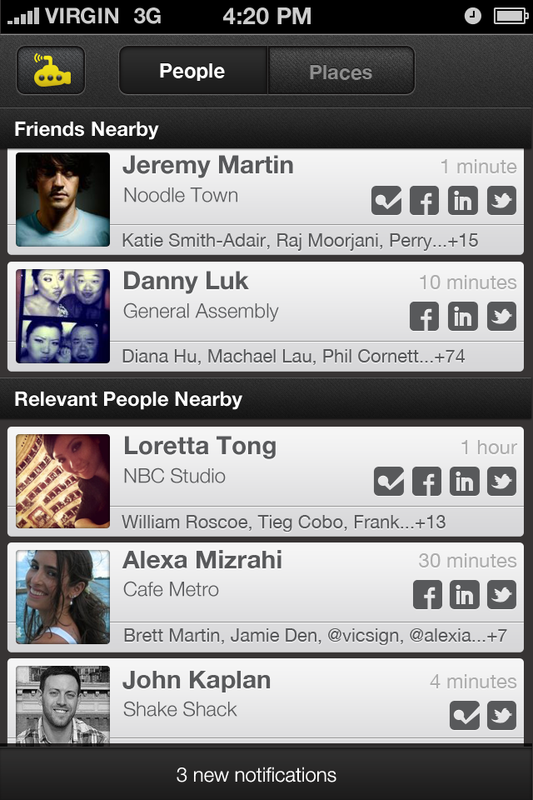 The app separates your nearby friends from a section of nearby “relevant” people, who are ranked based on how many friends you have in common. Like Banjo, the app finds nearby users based on their check-ins in (or geotags) on Facebook, Twitter and Foursquare, but fills out user profiles with data that also includes LinkedIn info. 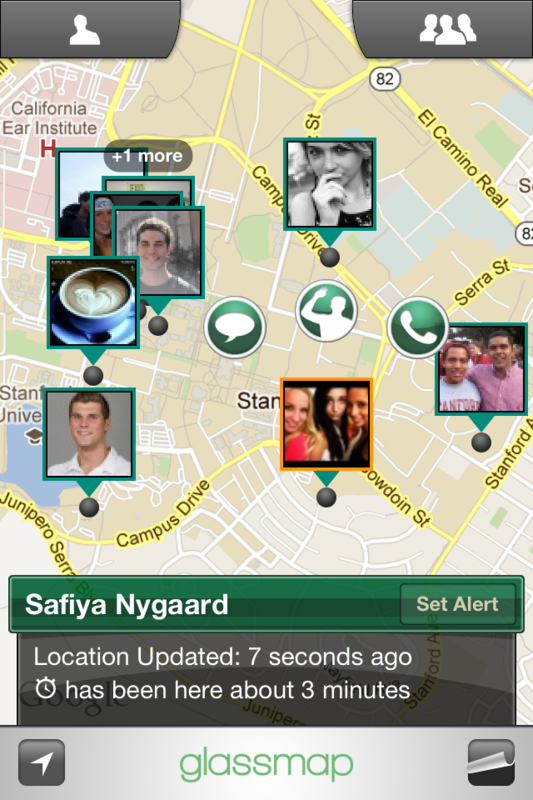 Also, like most others in the space, Sonar can alert you when friends are nearby. This app will be helpful to those at SXSW who are actually there to attend panels and presentations, not just parties. Why? Because EchoEcho can map your friends indoors, too. Launching just in time for SXSW, Kismet finds nearby people using ambient location data like Highlight and Glancee, but also finds them using active check-in data like Sonar. The app lets you create “pop up events,” too, which can then be discovered by other app users who are nearby (think “happy hour drinks,” “SXSW panel on social apps,” etc.). 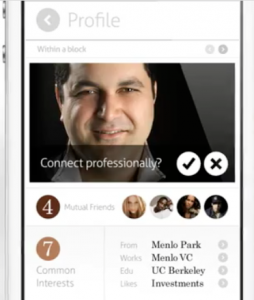 Nearby people are ranked based on degrees of separation, which extends beyond mutual friends. 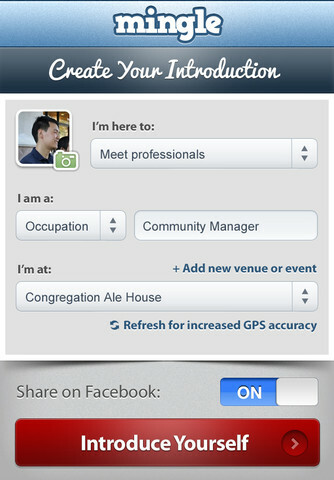 Kismet is also one of the few that lets you check-in to both Foursquare and Facebook, saving you that extra step. 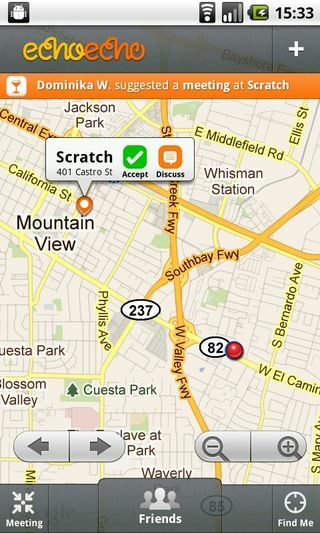 Glassmap is more of a “Find My Friends” type of service, except one that works cross-platform (iPhone & Android). Built on top of Facebook, Glassmap finds your Facebook friends who are on Glassmap and plots their location in real-time on the map. You can selectively enable or disable who can see your current location, and the app makes smart use of server technology to preserve battery life. Not to be confused with INTRO, the business-focused app, ntro is for meeting people who share your interests. You can either enter in these interests manually, or have them imported from Facebook. The difference with ntro (which is almost like the social version of INTRO, surprisingly! 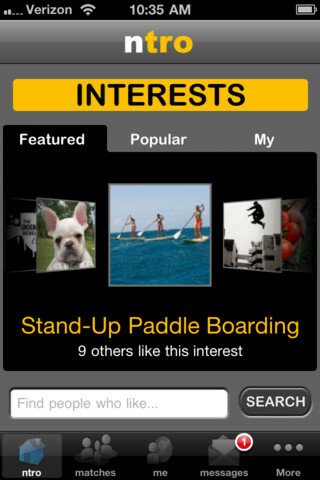 ), is that you can filter through search results by interests and set your own “top” interests very narrowly. (e.g., not just “music” but a name of a band). Ntro also allows you to message users who share interests in common with you. Cons: Limited support for cities. Ntro works in S.F., L.A. and plans to roll out to N.Y., Chicago, D.C. and Boston. Just added support for Austin. Mingle is most similar to INTRO, in that its focus is on business networking. You join Mingle using either your LinkedIn account, Facebook account, or you can sign up directly. It will then show you who’s nearby and available for networking using your phone’s GPS. Like INTRO, you can specify your occupation and who you want to meet, but you can also post that “intro” to Facebook, if you choose. The key difference between Mingle and INTRO, however, is that users are ranked by proximity alone on Mingle – there isn’t an indication of the friends or friends of friends you may have in common. Meant to be more of a replacement for business cards than anything, CardFlick also connects with Facebook, LinkedIn and Twitter for sign in purposes, or you can create your own account. You can then customize your card with your personal info and a theme of your choice from top designers. The location-based element comes into play when you go to the “flick” screen – this area shows you nearby users you can “flick” your card to. And if they’re not on CardFlick, you can just email them your card instead. 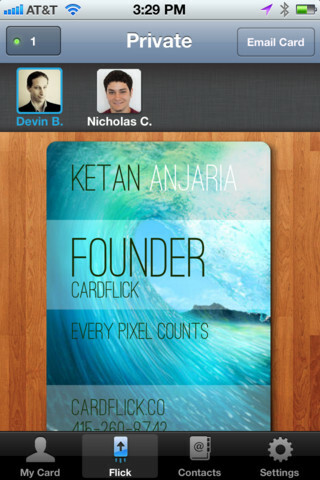 Meanwhile, CardFlick keeps track of all your contacts in the cloud. There are some other apps that are worth mentioning, but may not be fighting for homescreen space at SXSW, depending on their launch time frames. One is the very interesting Discover Circle, from the YC-back startup LikeALittle (LAL). Launching in a few weeks, the invite-only app looks beautiful, but will be focused on connecting you with groups of people (like school friends, fans of a particular TV show, etc.). That’s a different take than most location apps, which will help it stand out. Aiming to launch this week, Cult will allow users to post photos and text all around SXSW and beyond. Cult provides locations with their own feed – a stream of text and photos for that venue. The database is already filled with 10 million places and 100 “cults” in cities around the world. For example, a party at SXSW may have a “cult” but so would a store like Starbucks. When you post to the Starbucks cult in one location, you are then connected to a stream of other Starbucks’ locations worldwide. As you join Cults, these are saved on your profile for later viewing. If you’re at all interested in this space, you have to read what Robert Scoble has blogged recently. He has been tracking this space with in-depth posts on why he thinks Highlight and Glancee will be the two hottest apps at SXSW, and especially why Highlight may be worth the investment.